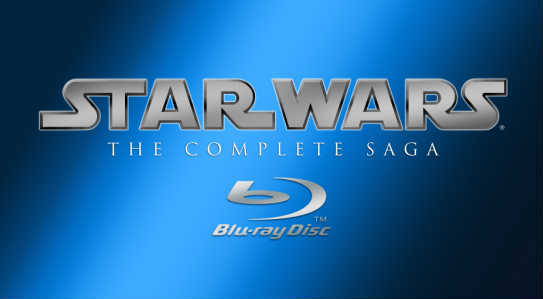 Star Wars Blu-ray Early Access App from I pad is giving fans an early peek at the 40 + hours of bonus materials from the upcoming Blu-ray release. Included is a 3 minute chat with Irvin Kershner about working with The Big Three on The Empire Strikes Back. According to Mark Saltzman, USA Today, Technology Live, there’s a ton of content so if you own an Ipad and just can’t wait until the September 16 release of the Complete Saga, here’s your chance. Iphone and Itouch people don’t despair. Apps will be available for you on August 2. Thanks to Suvudu you can now head over to their site and view the Epic Fantasy panel discussion from SDCC. The Panel consisted of fantasy heavy hitters George R.R. Martin, Brandon Sanderson, Kevin J. Anderson, Christopher Paolini, Peter Orullian, Patrick Rothfuss and K. J. Taylor. Kudos to Shawn Speakman of Suvudu for recording the panel and sharing the video. 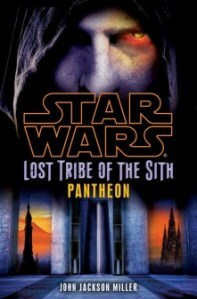 Here’s some good news for Star Wars kindle users: Lost Tribe of the Sith: Pantheon by John Jackson Miller is available for download. The better news from Star Wars Books Facebook is that it’s free. If you happen to have a kindle, head over to Amazon for the free download. You were so much better in 1995. Every now and then (read: once every ten years or so) I get the urge to clean up my dreaded Technology Closet of Doom. Like a time capsule lost to the ages, this closet contains delightful relics of a bygone era, when apps on a cellphone consisted entirely of Snake and CPU clockspeeds were measured in these archaic units called megahertz. With much sadness, I took these ancient items and placed them in boxes to be discarded. Farewell, Pentium II motherboard and chipset that I have no idea why I kept. So long, broken Sega Genesis that I was never going to find the time to fix. Goodbye, VHS copy of that horrible anti-drug mashup of cartoon characters that … Okay, I have no idea how this got in there. While knee-deep in old technological artifacts that probably belonged in the possession of the Smithsonian, a CD jewel case caught my eye. Picking it up and turning it over, I discovered that it was my copy of Star Wars: Rebel Assault II that my dad bought for me way back in 1995 when I was seven. Cue nostalgia music. It had been about fifteen years since I had played it last, but Seven-Year-Old Lane thought it was the greatest game ever to grace the family computer at the time. I used to rush home after school to load it up and play through levels I had already beat dozens of times. In the world of Star Wars books a couple of things of note came out earlier this week: Jeff Grubb’s novel is set right before the New Jedi Order series, and Tim Zahn has talked with Shelly Shapiro about doing a new novel. The Jeff Grubb news was a quick answer from Star Wars Books on their Facebook page. However, the news about the possible Zahn project has a little bit more information to it. Tim Zahn spoke with Star Wars Action News about it in a recent interview. There will be new characters and a cutting back of old characters. The time period will be new and unexplored. Release would be November 2013, but there’s also the possibility of this becoming a duology. Release dates could change. Zahn’s project has not yet been greenlighted by Lucasfilm. Here’s hoping LFL approves and we get two new Star Wars novels from the author who gifted the EU with some of its most popular characters. Unfortunately we were unable to obtain a picture of the inappropriate “area”, so perhaps we’ll never know what the cops objected to. With all the slave Leias running around it must have been…something. This week for science Thursday it brings me great pleasure to report that the planet Pluto got a new moon this week. Or rather The “dwarf planet” Pluto. For that matter, it was a moon that was always there but we, the evolved primates of planet Earth, have just discovered it. "I said sit Cerberus! Bad dog!" Currently designated as “P4” by NASA, the name “Cerberus” is the favorite in the naming pool for the moment. 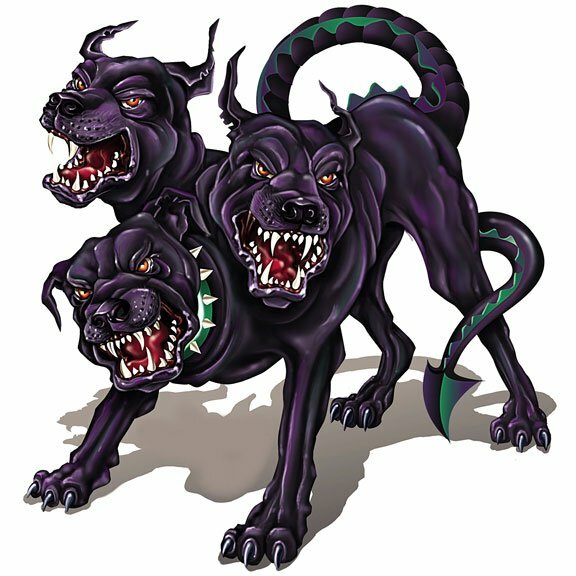 Cerberus was the three headed, snarling, drooling, vicious hound that guarded the entrance to Hell in Greek mythology. Perhaps it is an appropriate name considering the harshness of the conditions in that little corner of our solar system. While any part of the solar system that isn’t on the surface of the Earth may not be very conducive to human existence, the extreme cold temperatures of Pluto and it’s system are easily some of the harshest possible. P4 is only between 8 and 21 miles in diameter. It was discovered on July 3RD after NASA technicians assigned to the Hubble Space Telescope noticed a faint dot on a long exposure photo of the Pluto system and decided to have a closer look. At that size it is the smallest of Pluto’s known moons, of which there are now four total. The other three moons are Charon (Charon or Kharon is the ferryman of Hades in Greek mythology who carries souls of the newly deceased across the rivers Styx and Acheron), Hydra (an ancient Greek nameless serpent-like chthonic water beast that possessed many heads), and Nix (the Greek goddess of darkness). All seemingly appropriate names as Pluto was actually the Roman god of the underworld. 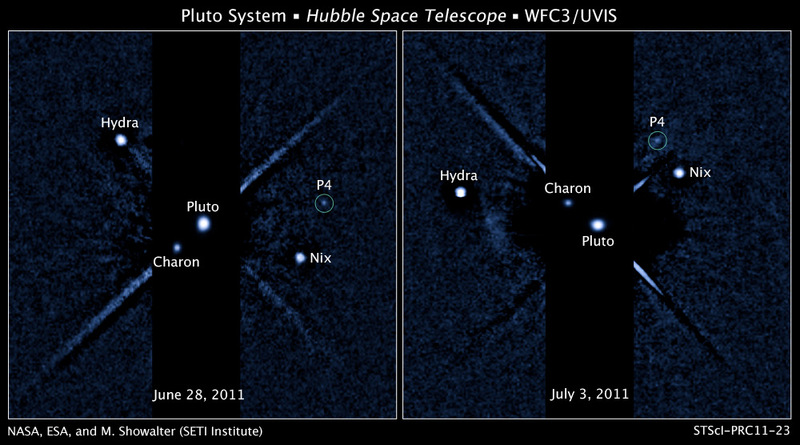 The Hubble image of Cerberus and the Pluto system. So welcome Cerberus, to our galactic community. We know you’ve been here some time now but shyly waited until now to be known. Perhaps one day we’ll swing by and say hello in person. Until then, try to stay warm and keep your kibble dry. Today Roqoo Depot wishes Star Wars author Drew Karpyshyn a very happy birthday! Drew turns the big 4-0 today so be sure to stop by on his Twitter page and congratulate him. In keeping with their practice of releasing extended excerpts of select works, Del Rey has released the first fifty pages of Star Wars: Choices of One by Timothy Zahn today. 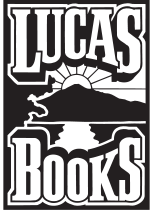 You can read the except at Scribd.com. Our own Skuldren reviewed Mr. Zahn’s latest offering just last week. That review can be read by clicking here. Timothy Zahn is a veteran Star Wars author who has now written eight total works for the SWEU including six that feature Grand Admiral Thrawn as the main character. The original Thrawn Trilogy was credited with rejuvenating the Star Wars literary world in the early 90s after some years of waning interest from the fandom. According to writers, Bob Orci and Alex Kurtzman, (via Cinepremiere) Trek 2 will finally start filming in January of 2012. With that start date it’s hard to see how the movie would be ready for a summer 2012 release so the smart fan should probably bet on not catching it until the summer of 2013. This is a long wait for fans who’ve been chomping at the bit to see it since the last Star Trek release, but if Trek 2 is anything like it’s predecessor penned by Orci and Kurtzman, it’ll be worth the wait.